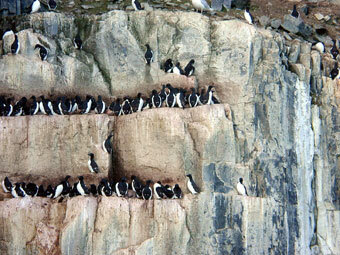 There is also a unique community on land which may interact with the marine communities. 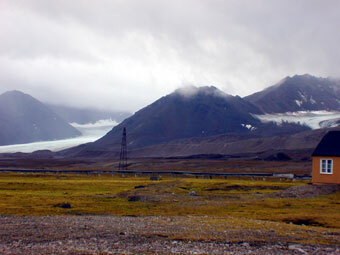 The high Arctic is considered a desert with very little yearly precipitation. Directly at the North Pole this precipitation remains frozen year-round, resting on top of the polar ice cap. There are few, if any, life forms there. However, the islands and edges of the continents that lie within the Arctic Circle often are ice-free during the summer and support a group of ice-adapted organisms in an association called the tundra. 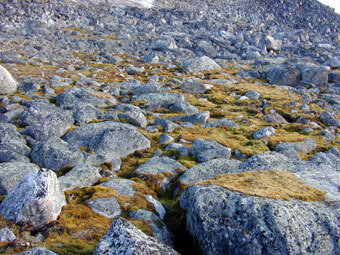 The tundra is a terrestrial area with permanently frozen ground (down several hundred meters) where there is thawing only in the summer in the top few feet. This type of community is considered one of the major biomes of Earth because of its uniqueness. 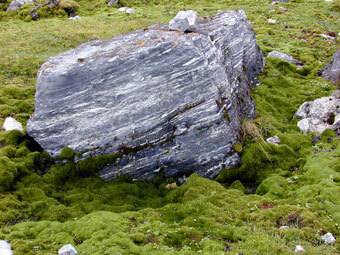 Lichens dominate the tundra as the major primary producer. 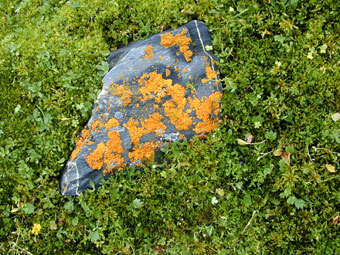 Many lichens can be covered with ice for up to three years and still remain alive. 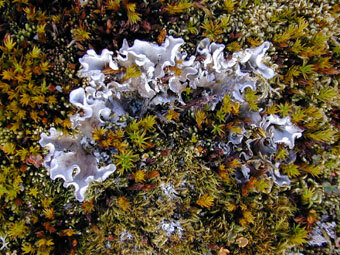 Lichens are a symbiotic relationship between two organisms – an alga and a fungus. 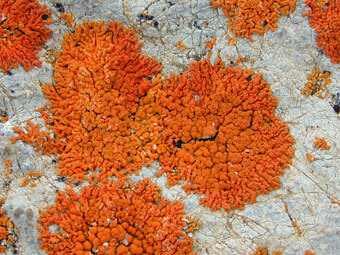 Together they become a creature we call a lichen and it is nearly impossible to tell the two apart in the body of the lichen unless you are a scientist in the laboratory. The alga provides the food and the fungus provides the water in this mutualistic symbiotic relationship. The alga photosynthesizes (using light, water, and carbon dioxide) to produce food (carbohydrates) for itself and its symbiont (the fungus). 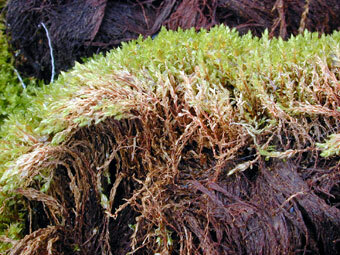 In return for its food, the fungus retains liquid water for itself and the alga to avoid dehydration. 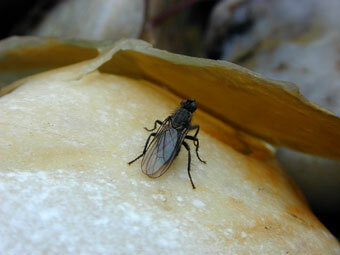 The fungus also attaches to the rocky substrate. 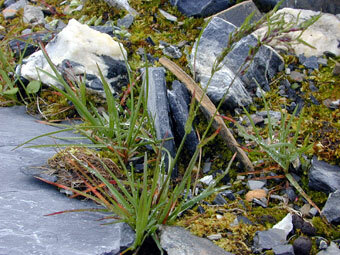 This combination allows both the alga and the fungus to live in an area where nothing else can survive (often directly on a rocky surface). 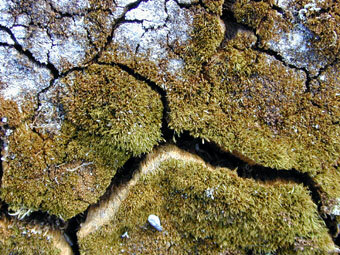 Without each other the fungus would starve and the alga would dehydrate. 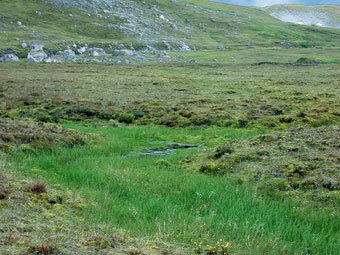 Mosses are often thick in the tundra where there is some soil and sufficient water. They can be so thick that they form a soft and squishy cushion in some Arctic areas, making it feel like walking on a soft mattress. 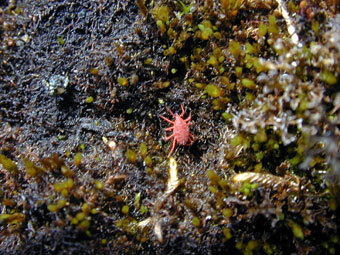 A tiny red mite can be found scurrying here and there among the moss plants. If the wind is not blowing you might even find a fly (one of the few insect pollinators for the flowering plants in the Arctic). 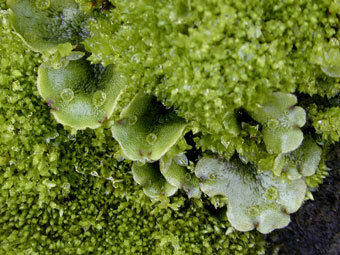 Liverworts are not as common but a distinctly different type of producer. 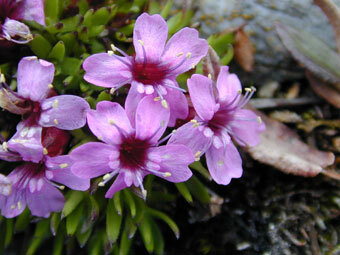 They are closely related to mosses and are grouped in the phylum Bryophyta – a type of non-vascular plant. 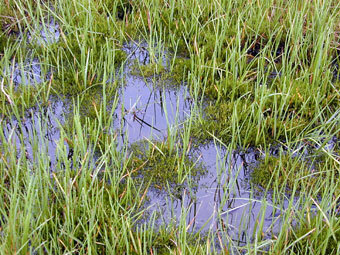 Grasses may grow along with the lichens, moss, and liverworts if there is enough water. 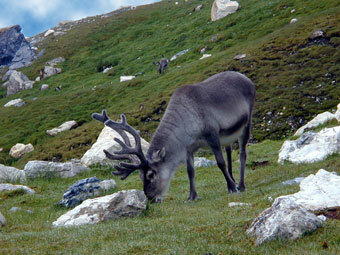 These are usually seasonal grasses and provide food for some of the larger herbivores, especially the reindeer. 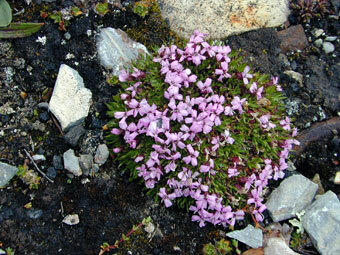 Small flowering plants also live during the Arctic summer in the tundra. Seeds from some of these plants provide food for migrating birds. 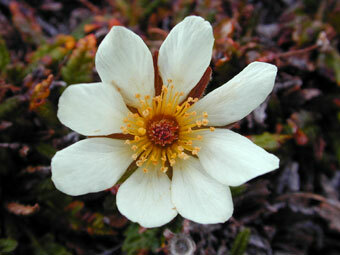 The plants themselves may be eaten by the few herbivores (reindeer, birds). 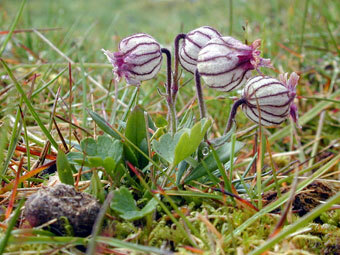 These plants often grow in areas where extra organic matter may be found – such as on the periphery of an abandoned bird nest or in a ‘fly way’ to a bird colony. This is because these Arctic terrestrial areas have thin soil and few nutrients and the bird excrement makes them a more favorable place for the plants as the excrement is used as fertilizer by the plant. 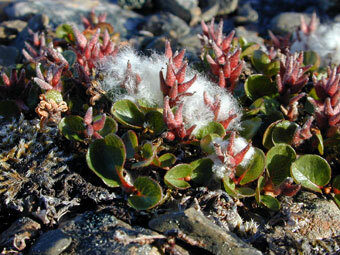 Miniature forests of Arctic willow live in the tundra and rarely get over a few inches in height. 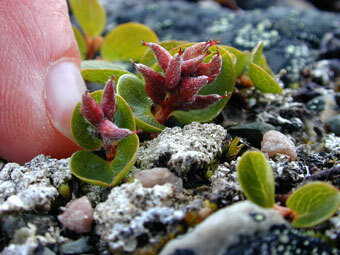 It is hard to imagine that these tiny plants are the ‘trees’ of the tundra. 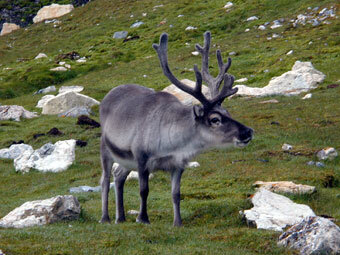 The reindeer are herbivores and the most northern of all the deer. They are the only deer where both the females and males have antlers. 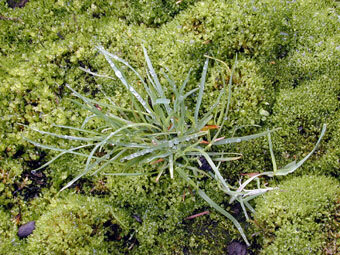 As herbivores (the second step in the food chain, also called primary consumers) they feed on lichens and grasses (the primary producers, or first step in the food chain). Occasionally they will eat a bird or bird egg if it is handy. 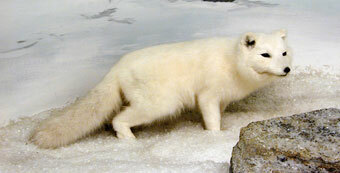 The Arctic fox is a terrestrial carnivore that changes its pelage color during the year. It is white in the winter, blending into the ice and snow. 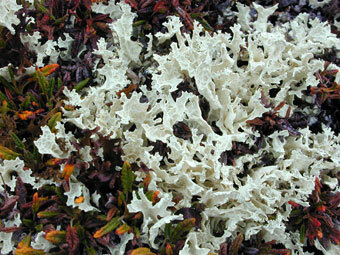 It is brown/grey in the summer, blending into the dirt and lichens. 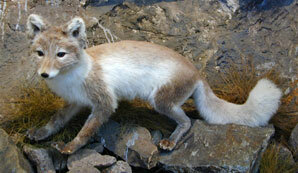 A rare blue form occurs in only a few of the winter foxes and is considered a valuable fur. These mammals feed on sea birds, rodents and anything washed ashore along the beaches. They are on the top of the food chain on land and are called secondary (or tertiary) consumers. 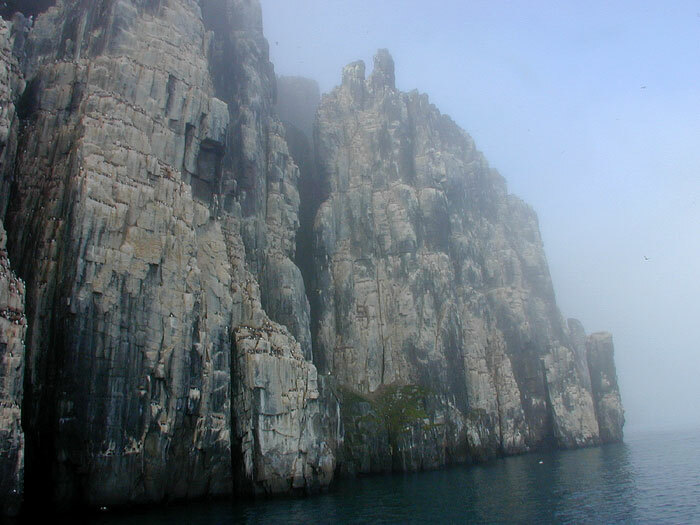 They are quick little creatures and it is believed that many sea birds nest in cliffs to avoid predation by the Arctic fox. The majority of Arctic birds depend on the sea and are called sea birds. A few birds feed on the terrestrial plants and their seeds or use the plant material for their nests but the ocean is the most important feeding ground for the majority of the Arctic birds. 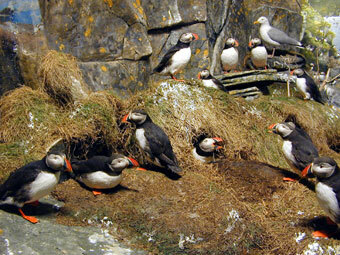 The Arctic Ocean is extremely productive during the summer and provides a wide variety of food items for these birds. Many of these birds nest, by the thousands, on secluded cliff faces where few, if any, predators can bother them during mating, nesting, and rearing their young. 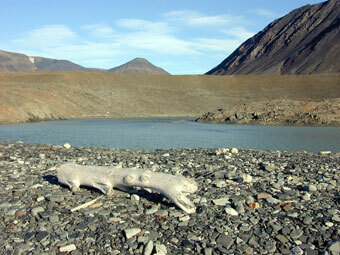 Decomposition is slow in the Arctic but it does complete the final circle of the terrestrial food chain. The cold temperature slows the metabolic processes of the bacteria and fungi that act as decomposers. 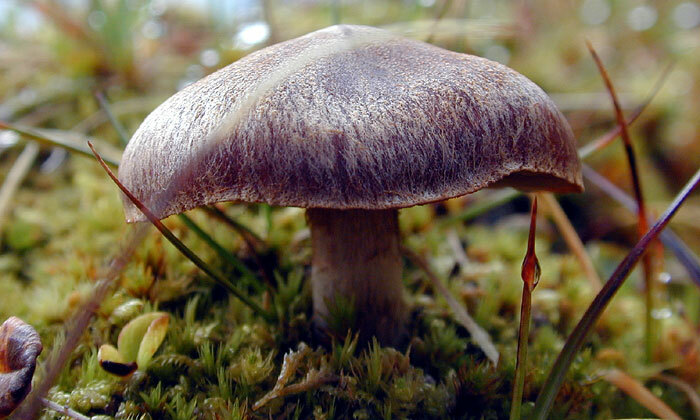 In the summer mushrooms abound after the terrestrial plants have had a chance to grow. These mushrooms are only the reproductive part of a fungus whose body is a net-like structure living in the soil or dead organisms. Because decomposition is so slow many artifacts and the bodies of missing explorers have been recovered almost intact many years later. 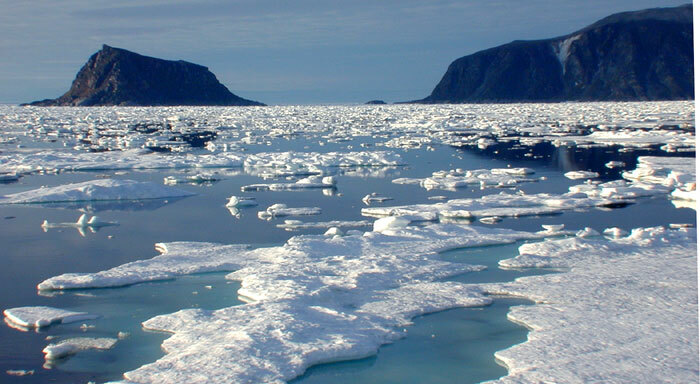 The ocean is a more stable environment than the land in the Arctic. The creatures living in the terrestrial environment face the fierce Arctic winters, with temperatures well below freezing (sometimes a -50 degrees Centigrade). On the other hand, the marine environment will be much warmer, a cozy -2 degrees Centigrade up to a +5 degrees Centigrade year-round. 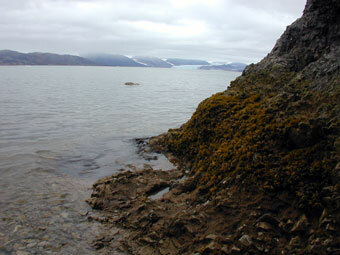 The tidepools are often barren in the Arctic, lacking the usual intertidal seaweeds and invertebrates. 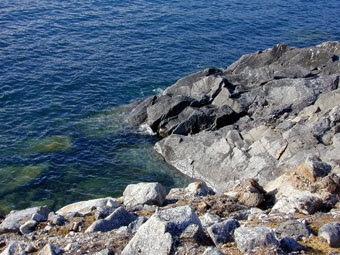 This is because in the winter the ice scrapes the rocky shorelines. 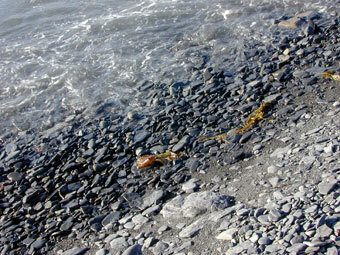 A few seaweeds exist in areas that do not normally freeze over (like in the lower fjords of Svalbard) and pieces of them can be found washed up on the Arctic shorelines. One of the most common things along the Arctic beaches is Siberian timber. It is amazing that these big logs float all the way around the Arctic Ocean and end up on deserted beaches. Back to the ocean, pinnipeds, cetaceans and polar bears are the large Arctic marine mammal consumers. The pinniped group includes the seals, sea lions and walruses. The cetaceans include the dolphins, porpoises, and whales. Two unique marine mammals, the walrus and the polar bear, are found only in the Arctic. The next two lessons highlight these two unique Arctic species.